...in the heat of the game, is as bad as too little ! 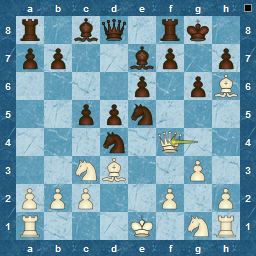 In what was probably a losing struggle for me as White at this point, I was focused on winning a pawn (e5) or Bishop, and had worked my Rook to the 7th rank for the purpose, also thinking of using the Bishop at h4 for attacks on the Knight. So yes, focused, and with more than one idea, but I missed the key idea, since in this position I believed my Bishop was well-placed, defending b4. 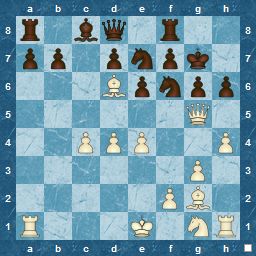 A simple combination wins easily for White. Can you see it ? On the other hand, you can never get enough of Focus, the band ! It seems amazing that "Hocus Pocus" reached the top 20 in 1972, with its nonsense yodelling vocals, but it did, probably a credit to the skills of all the musicians concerned, and possibly to a more discerning music public back then. "House of the King" was the B-side of the same single. I thought it was great when I discovered it via a friend's "Focus III" album, but finding the live clip below ( that hair, those boots ! ) is a marvel ! I bought the re-mastered "Focus III" and enjoy it immensely, along with "Focus Live at the Rainbow", both great music, and memories of my youth ! Focus still record and perform, but these days without guitarist Jan Akkerman who remains a solo artist. I always enjoy it when White opens with 1.d4. Replying e6 and seeing 2.e5 appear on the board, allows me to steer straight to the French Defence, and find out if White really intended this or not. Never seen that so early in a French ( and my database agrees : only two games found, both played in Junior competitions ). 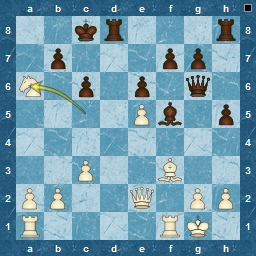 I know why it is played at later times ( often after Bb4+ ) to force the weakening g6 or the return of the Bishop to f8, with the loss of a tempo, but on move 3, it just doesn't work. It probably means that White does not know the French Defence, and this was proved true in a short space of time. 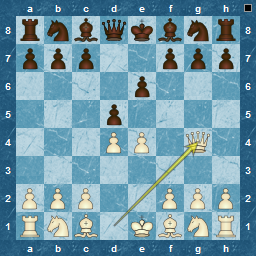 Here is the critical position after Black has developed and won material, by chasing the Queen. Black to finish White with a killer blow, and not difficult to find. 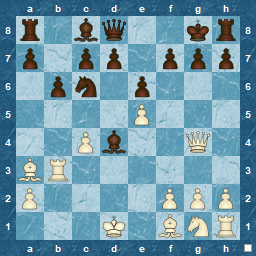 4 e4 openings, 4 with d4, and 2 others ( Réti/English). Hardly much of a change in major openings played, nor on the split between King- and Queen-pawn, with 1.e4 grabbing 53% of the games. 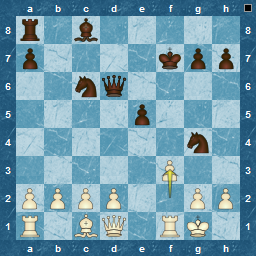 Oddest opening was 1.a3, which lost, although the opening can hardly be blamed for the tactical oversights in the game. One Falkbeer Counter-Gambit, and also nice to see 1.Nc3 appearing twice, once transposing to a Philidor and the other remaining independent. Dirk van Geet would be pleased to see it still in action ! 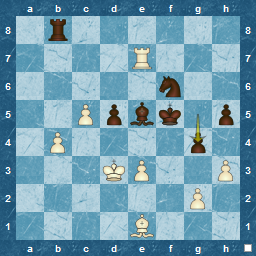 Seven games less than 10 moves, but no traps, just over-looked tactics at fault. All games were re-indexed by ECO code using Chess Assistant 11,. It's fine for a bit of relaxation, maybe for trialling and gaining some experience in a new opening, but the most frustrating part is going over the games afterwards and finding that you missed a great combination or sacrifice, which you may well not have missed in a 'proper game' with more time. 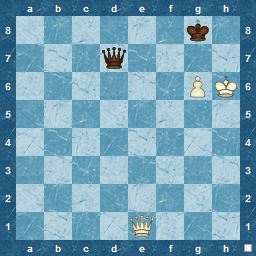 I know why I missed it ( I'm Black, by the way ) as I had been focusing on defence around the king. 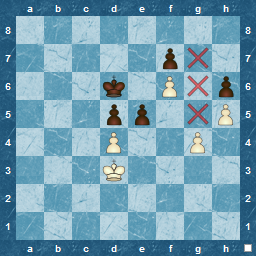 threats down the h-file, threats of knight and Queen versus h7, etc, plus the fact that it was 'second time around', since it had been on show a couple of moves before. But I did, I missed a lovely riposte that would have switched Black to attack. Nevertheless, I managed a draw,which was a satisfying result for me. ...."What is it good for ? Absolutely nothing "
We are always warned of being greedy with material captures, and in hindsight its always easy to spot mistakes. These occur in standard as well as blitz, but the latter gives rise to more of them. Black to play : should he re-capture with Rxh2 ? 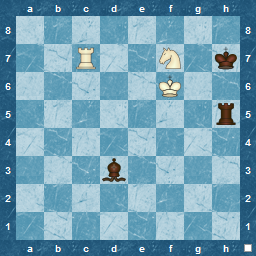 White to play : should he play Bxf8 ? 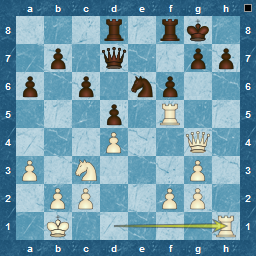 Here White has captured a pawn, with Nxa3. Should Black take the knight ? 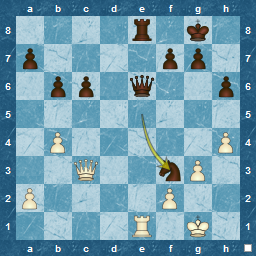 Black to play: should here re-capture with bxa3 ? Not difficult decisions, but in the heat of the moment, and with the focus on your own plans, mistakes can be made ! The secondary point, is to bear in mind spotting mating patterns. An obvious one in the first example,in the second its clear, but maybe not obvious. The third is also less obvious, but quite straightforward. 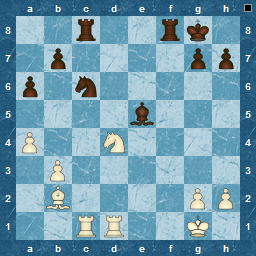 Black has played c6, what is White's best move ( and its not Nxa3 ) ? Although at first glance it looks bad for White, in fact the precarious position of the Black King offsets his passed pawn ! I would be extremely happy to be able to find such a combination in a match situation ! 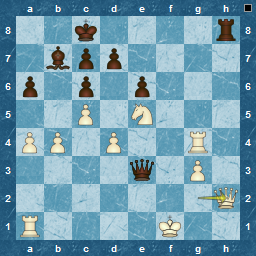 As Black, I was presented with this position, after the Knight has captured a pawn on d4. Instinctively, I felt there was a correct combination here, that would give an advantage to Black. My game continued [33...Nxd4 32. Rxc8 Ne2+ ? 33. Kh1 Rxc8 34. Bxe5 Re8 ? 35. Rd5 ?? 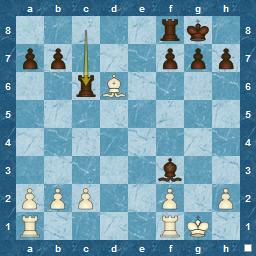 Nf4 ] which won, but was a bad combination. 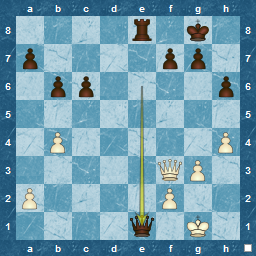 This isn't a complicated " White to play", but from my point of view its more that it shows for me that these days I appear to 'see' things more than I used to. 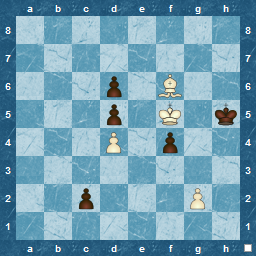 The idea occurred on the previous move when the Black Queen was on d8, but it didn't work. The surprisingly summery Summer has distracted me from the blog. Just to keep things ticking over, here's a simple one for you. 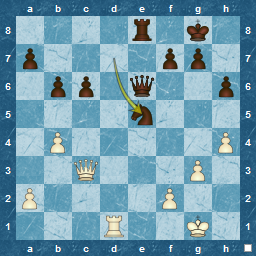 A simple, but intriguing endgame from the Leonard Barden chess column in the Guardian. Leonard Barden was one of the two chess authors who enriched my schoolboy days, the other being Harry Golombek. Although Fred Reinfeld may be very well known in the US, in Britain in the 1960s and 1970s, I had barely heard of him, and, obviously, stuck with home-grown authors. My local library appeared full of Barden and Golombek books, and after many borrowings, eventually I bought Golombek's "The Game of Chess" and Barden's "Chess" ( I think those were the titles ). I also dabbled with "Teach Yourself Chess", which in those days was written by Gerald Abrahams, another great chess educator, but frankly, not for youngsters, as it is far too erudite. I still have the Golombek book, but Barden's book is nowhere to be found in my house, maybe its hidden at my parents'. A couple of years ago, I saw and bought another Barden book, his 1957 'A Guide to Chess Openings', in hardback, and in remarkable condition for its age ( it was second-hand ). It is very enjoyable seeing recommendations from 50+ years ago, along with games by players that are distinctly minor now, but presumably were significant at the time, such as Borodin, Unzicker, von Scheltinga, Kramer , as well as stalwarts of the British chess scene like Milner-Barry, Thomas and Yates. 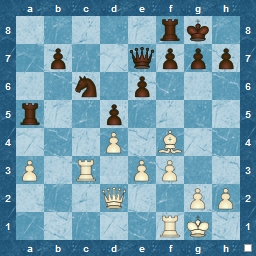 Blitz chess for me, is addictive, and almost pointless, often together. It is easy to waste hours online playing it ( hence 'pointless' ) , with practically no "chess" knowledge-gain at all, whilst losing an immense amount of time. That's not to say it isn't enjoyable, just that you need to be honest with yourself about why you are doing it ! However, I am equally sure that such a gain will work primarily for players who already have the appropriate tactical skill level and so can concentrate on the positive aspects they want out of blitz, rather than constantly avoiding tactical mistakes in the limited time available ( or is that "suffering from the inevitable blunder" ? ). This positive aspect is often presented as 'gaining experience of new positions' or 'trying out new openings', ie playing a lot of quick games to end up with a feel of what positions arise from the opening, and then using this as input to the next stage in opening practise, that of adding (more) theory. For my part, I have re-appraised how I spend my blitz time on the Net. 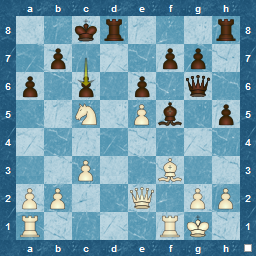 Here's another CTB position, and no, its not a smothered mate despite so many pieces on the board and around the king. 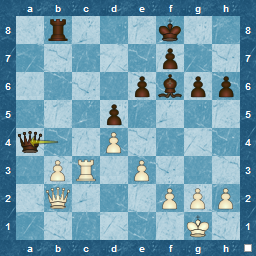 Its also notable that there isn't a forced mate, although that is the solution given in CTB. Admittedly, if you don't follow the given solution ( ie the reply from Black ) , then Black is on a fairly downward course, but technically, its not forced ! As I trawl through CTB slowly, I find some interesting positions. Here's one related to a theme that I seem to enjoy. Not that hard, but you'll probably dismiss the solution first time around. 5 e4 openings, 4 with d4, and the Réti. Labels: Openings, Team 45 45, Team 4545, Team 4545.